Ray ‘Hollywood’ Roberts’ Hollywood Boulevard sustained hull damage, causing retirement from the 2015 Hobart. 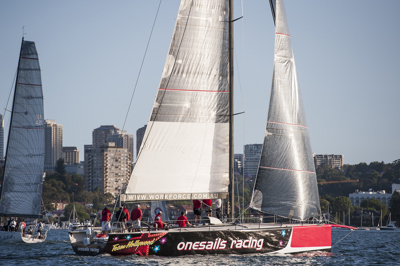 Competing as OneSails Racing, finished 49th overall in the 2014 Hobart after a sunfish took out the port rudder. He is hoping the former Living Doll, second overall in the 2011 Hobart, will propel him to overall victory this year. Roberts chartered The Goat, a Sydney 38, rebadged it Team Hollywood and convincingly won the IRC Passage Series at Airlie Beach and Hamilton Island Race Weeks. He is a regular at the major Asian regattas and has won all numerous times. Top results in a distinguished career include taking Quantum Racing (now racing as Victoire), to line and overall honours in the 2008 Sydney Gold Coast. Renamed her Evolution Racing and finished second in Division 0 of the 2009 Hobart, after winning Brisbane Gladstone line honours for the second year in a row. Crew member Michael Spies will sail his 40th Hobart this race.